A Key Flexfield as the name suggest is a key building block of a module and is required for defining the structure of objects of that module e.g. The Account Structure, Item Structure etc. Key Flexfield captures mandatory business information like company department, account etc. Descriptive Flexfield captures additional business information like name of the company’s MD etc. 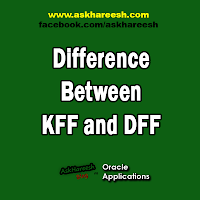 15 attribute columns are reserved for the DFF’s data.